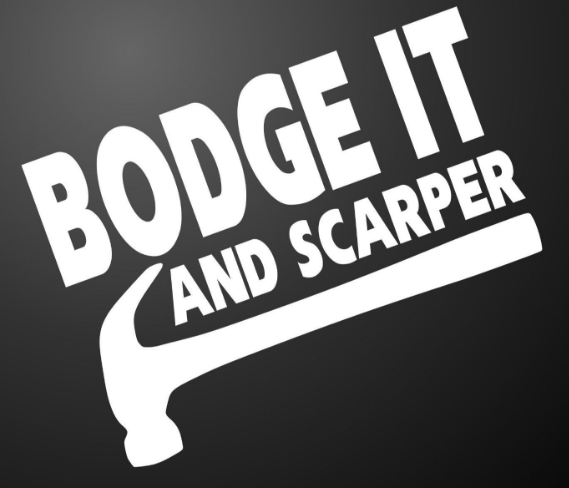 Bodge it and scarper – Family Wise Ltd.
What me? On TV? Seriously? When we moved in 2011, the office premises (now known as FWL Towers) left a little to be desired in places and hence, we did not quite meet the asking price but knocked a few tens of thousands off before we agreed our purchase. One of the issues was the windows. Yes, the windows were double glazed but the frames were wooden. “Oh yes, we sand them down every few years and re-paint them”, announced the previous owner. “Really?”… rather incredulously, I mulled over this possibility. Number 1: the window frames didn’t look like they had been painted in more years than the previous owner had owned the place and Number 2: there was not a cat in hell’s chance of us doing that, EVER! So, part of the reduction in price was so that the windows could be replaced. Half tick…. fronts have been done and now, to replace the back ones. The same previous owner seemed to give DIY a shot but really, should have kept the lid of the tool box firmly shut. The fencing around the outside of the property separating us from neighbouring pastures included panels which were not the correct size to actually meet with the posts and hence, with a strong gust of wind or two (common occurrence in these parts), the panels and posts parted company in rather spectacular fashion (replaced in 2014). Now, attention has turned to the interior and this last weekend, Mr FWL and I decided that one particular ‘floating shelf’ was, quite frankly, surplus to requirements (in fact, it always had been and was a particular artefact from yester-owner which both I and others despise). And so, I began the straightforward removal of the shelf, or so I thought. After removing the shelf from the bracket, I started work on the eight screws holding the bracket to the wall. Slowly but surely, parts of the wall began to disintegrate. For some unaccountable reason, said ‘DIY expert’ had decided to use somewhat inappropriate fixings with screws deeper than the wall cavity. What on earth….!? So, of eight screws, only four extracted themselves without removing wall parts at the same time and we were left with a rather substantial hole in the wall. What should have been a simple task (I know, Pa FWL, you always say that no task is simple on the DIY front and you are right!) took a trip to B&Q plus a raid of Mr FWL’s garage to locate the appropriate fixing kit. On a positive note, a trip to IKEA means that we have two new swish shelving units for the office and all the previously homeless items are now more efficiently stored. What a successful weekend….